It is really good post. I am searching for the manual of water pumb installation for a long time. Thanks for this share. 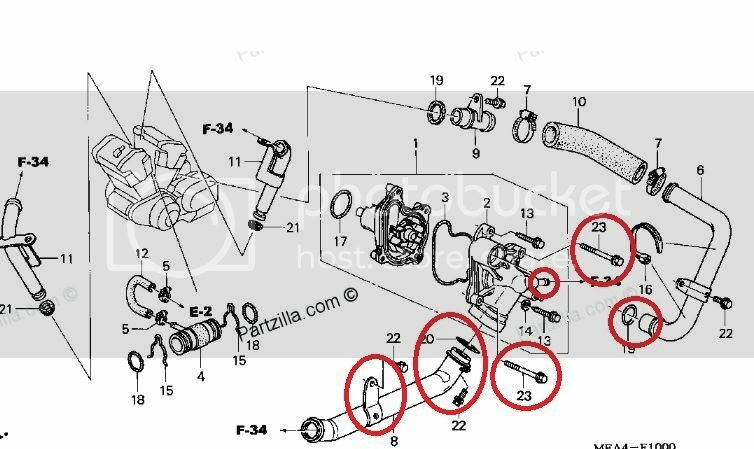 Good write up and good guidance when I had to change the water pump on my 2006 VTX 1300 R at a few miles from hitting 44 K. Starting leaking some time back, but I figured it was just the coolant vent leaking. It always had a full system when I checked it, but the other morning I came out to the garage and noticed a flat on the rear from riding the day before, while I was checking on this noticed a puddle of coolant and on closer look found it coming from the weep hole. Had to use a mirror to find it. It was coming out pretty good. I believe the service manual calls it the tell-tale hole. I pulled the water pump off and everything looked good including the O-rings etc, but the manual mentions "water pump mechanical seal being defective " could cause this leak. Must be something on the inside of the pump. Anyway, ordered a new pump, o-rings and screws from a place in California called Temecula Motorsports. com. They had the pump for $136.00 plus the other items I needed and shipped free. I checked with dealer who wanted $198,00 for the same part. I did not mind waiting four or five days to get it for that kind of difference. I got the order in tonight about 7 PM and decided to install it since I had pulled the other one already. Everything seems to work out OK with this write up and the service manual as a guide. Had to change oil and coolant. Does not appear to be any leaks so far, but will give it a test ride tomorrow. While the Service Manual does not mention this, most people seem to recommend putting lube on the coolant system O'Rings. Most recommend you use Silicone grease and the best place to find it is in the faucet repair section at Home Depot. It costs under 4 dollars. I used it.